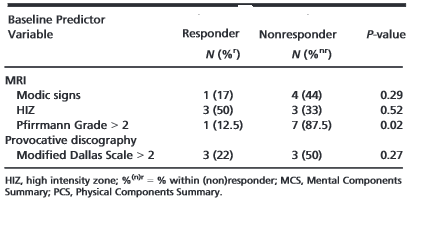 Methylene blue injections were an exciting option after a Chinese article was published in PAIN glowingly detailed great responses to intradisc injections. Dr. N. Bogduk, at time, wrote an editorial suspicious that Chinese patients might be reluctant to admit they were not better. Since that time, there has not been much positive. Now it looks like at 3 months time, 47% will be at least 30% better. 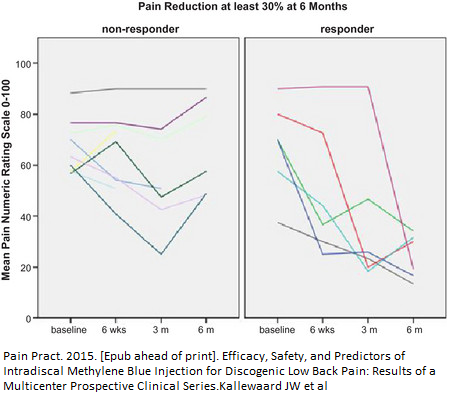 Efficacy, Safety, and Predictors of Intradiscal Methylene Blue Injection for Discogenic Low Back Pain: Results of a Multicenter Prospective Clinical Series. Kallewaard JW(1), Geurts JW, Kessels A, Willems P, van Santbrink H, van Kleef M.
Comment – so 40% have the disc as a major part of the disease. A certain proportion of pain is going to be coming from Modic changes – only 1 of those got better though lacked statistical power for lack of cases. pirifomis, sacroiliac, gluteal, thoracolumbar, psoas, and of course lumbar facets need to be all work on repeatedly to maximize the benefits. This entry was posted in Back Pain, Injection. Bookmark the permalink.